No Southern supper would feel right without an occasional serving of collard greens. And no New Years Day celebration would be complete at my house without a big pot of Hoppin’ John, which combines rice, blackeyed peas, and collard, mustard, or turnip greens. Traditional folklore claims a bowl of Hoppin’ John on January 1st ensures prosperity in the coming year. It is certainly packed with protein, fiber, vitamins and minerals. Personally, I just love how it tastes! What many people don’t realize is just how healthy collards are for you, or how easy they are to grow at home. Collards (Brassica oleracea, var. acephala) are biennial members of the cabbage family, along with broccoli and Brussels sprouts. In fact, collards, along with kale, are actually non-head forming cabbages! The name, collards, comes from the word colewort, or wild cabbage. Along with kale, collards are one of humanity’s oldest cultivated vegetables. Collards contain more vitamins and minerals of any other vegetable, along with kale. Eating collards regularly is believed to reduce the chance of some types of cancer. A study published in Nutrition Research found that eating steamed collard greens was 13% more effective at blocking ‘bad’ cholesterol than the prescription drug Cholestyramine! Collard greens, being a dark leafy vegetable, also contain high levels of Vitamins A, K, and C, along with manganese, dietary fiber, and calcium. Google collard greens and you are sure to see them listed frequently in the world’s healthiest foods, so why aren’t they growing in everyone’s garden? Unlike spinach, which can only tolerate gentle cooking, collards often need to be cooked for 15 to 20 minutes to soften completely. The liquid left behind after cooking collard greens is called pot liquor, or potlikker. Frequently seasoned with salt, pepper, salted pork or smoked turkey, pot liquor makes an excellent broth, made even better when sopped up with a piece of freshly baked cornbread. So, let’s get some of these healthful, flavorful plants growing in your foodscape! Collards can tolerate temperatures as low as 5°F, but they will bolt in our California summer heat. Bolting does not affect leaf flavor (and it can give you seeds for your next collard crop), but collards are generally a cool season crop. A light touch of frost actually sweetens the flavor of collard greens. Here in the Bay Area, collards can be planted February through April, and again in September and October. These plants can get relatively large, with broad, waxy, dark green leaves. They prefer lots of sunlight and need plenty of organic matter in the soil. You may need to acidify the growing area, as collards perform best in soil with a pH of 6 to 6.5. Plant collard seeds 1/4 to 1/2 inch deep. You can start seeds in cell flats and then transplant into your garden or foodscape. [Since seed packets nearly always contain far more seeds than you will ever need or use, hold a seed swap with friends and neighbors!] If you direct sow, plants should be thinned to 18 to 36 inches apart, depending on the variety. Side dress plants with aged compost or manure every 4 to 6 weeks, and mulch around plants to reduce competition from weeds and to maintain moisture levels and temperatures. Collards have a shallow root system and water-stressed collards taste far more bitter than properly irrigated plants. 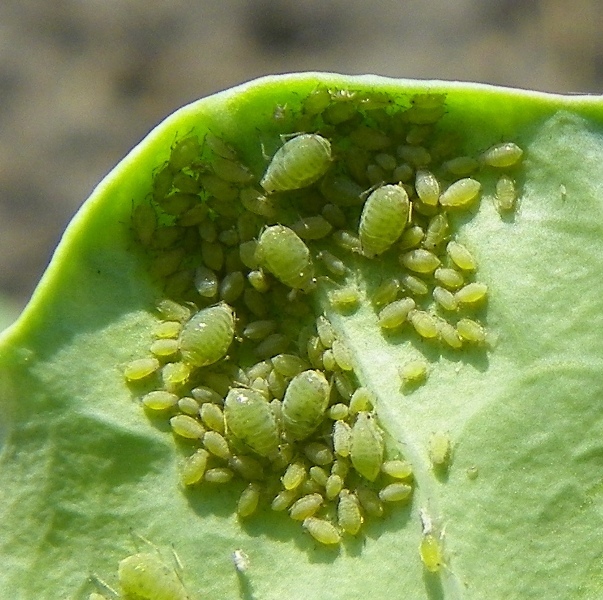 As with other members of the cabbage family, collards are frequently fed on by aphids. You can blast these pests off of plants with a powerful stream of water from the garden hose, or you can apply insecticidal soap. Cabbageworms, slugs, and cabbage loopers can be handpicked. [I feed them to my chickens.] Flea beetles, bagrada bugs, whiteflies, and cabbage root maggots can also be a problem. Research conducted at UC Davis found that flea beetle and aphid populations can be reduced when collards are interplanted with beans. They found that the same was true for weeds, but I’d rather have beans than weeds! Apparently, the mixed plantings work better at attracting parasitic wasps, making crops harder to find, and by providing other food sources for the pests. Diseases that affect collards include white rust, blackleg, cabbage yellows, and clubroot. You can reduce the likelihood of these diseases occurring by rotating crops in the cabbage family into a different growing space each year. Most collard varieties are ready to harvest in 55 to 75 days. Collards are one of those cut-as-you-go crops. Just keep picking outer leaves, as you want them, and the paints will continue producing more for several months. It is a good idea to allow plants to reach a height of at least 10 inches before harvesting leaves. If you find that you have more collard greens than you can eat, you can always cook them and then freeze them, for longer storage. Your friends and neighbors may appreciate some, as well! Collards are large, attractive plants. They do not need to be sequestered into traditional garden rows. Find a nice, sunny spot in your landscape and make it home to your very own collard plant!